UPDATE 11/3/18: Due to the extreme wet weather, Fall Festival at Quarry Road Trails has been POSTPONED until tomorrow, Sunday, November 4, from 10:00 to 1:00. We're looking forward to a much drier and brighter day tomorrow. 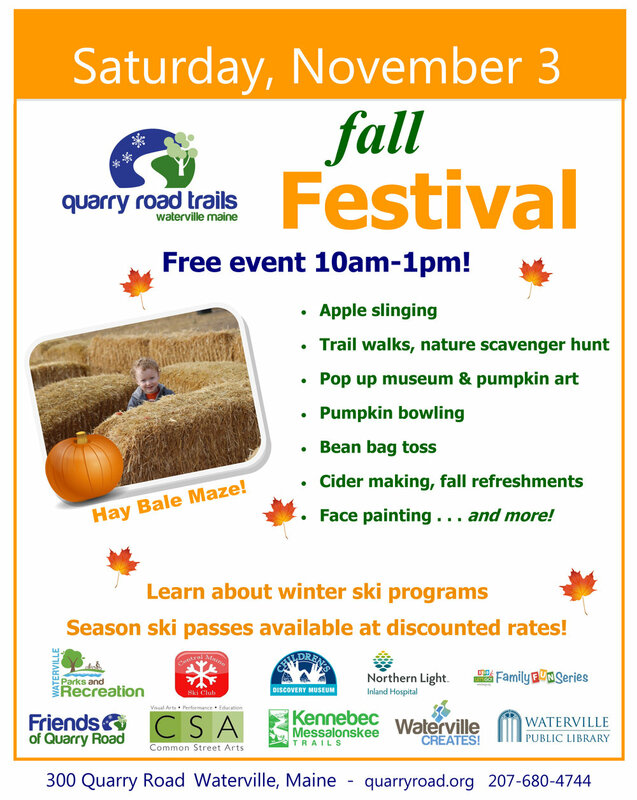 On Saturday, November 3, the community is invited between 10 a.m. and 1 p.m. for the Quarry Road Trails Fall Festival in Waterville. All are invited to this free community event to enjoy fun activities, explore the trails and learn about winter programs, volunteer opportunities, recent updates and future plans. Quarry Road Trails is located at 300 Quarry Rd, Waterville, ME. Family-friendly activities will include trail walks, pumpkin bowling, apple slinging, bean bag toss, face painting, and more. Common Street Arts and the Children’s Discovery Museum will offer a pop-up museum and pumpkin art. Cider making and fall refreshments will be provided at no charge and 92 Moose will be on-hand with a live radio broadcast throughout the event. Season ski passes for the upcoming season will be on sale at pre-season discounted rates and information about youth ski programs will be available. The Quarry Road Fall Festival is the November feature event of Northern Light Inland Hospital’s Let’s Go! Family Fun Series. Hospital volunteers will be on-hand to register new participants for this free program linking families to local resources like Quarry Road Trails for year-round, free and low-cost, active family fun. For more information about the Fall Festival, contact Waterville Parks & Recreation at 207-680-4744.